The Camino de Santiago has reached a historic milestone this week, surpassing a figure never before achieved since records are kept. This Tuesday has reached Santiago de Compostela pilgrim 300,000 of this 2017, a symbolic figure unknown until now, even in Xacobe years, when the greatest international claim has among the pilgrims the Camino de Santiago. The pilgrim who has starred in this round figure is 22-year-old American Andrew Larkin. 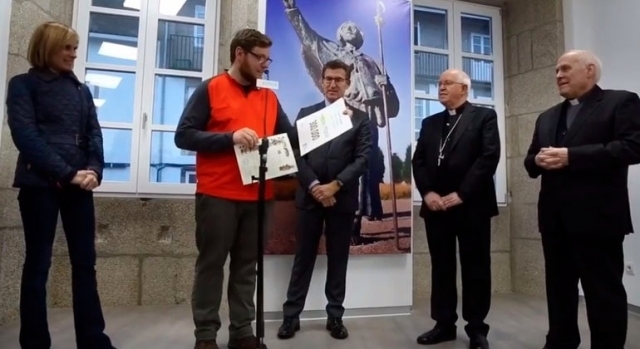 This student of chemistry has been honored this Wednesday in the Office of the Pilgrim's Welcome of Santiago de Compostela by personalities such as the president of the Xunta de Galicia, Alberto Núñez Feijoo or the archbishop of Santiago, Juan Barrio. Larkin, who has spent the last months in Burgos learning Spanish, has received a gift and has promised to recommend the route when he returns home. The pilgrim living in Michigan has traveled the French Way from León to Galicia, and has commented that he knew of the existence of the Jacobean phenomenon as a result of watching the movie 'The Way', starring Martin Sheen. The Camino de Santiago 2017 did not need to exhaust the month of December to surpass the total records of last year, when the absolute record of 278,041 pilgrims was reached. Therefore the total figure for this year, once we eat the grapes, will be ostensibly above the 300,000 registered pilgrims to date. El día que llegamos a Santiago en Agosto , según La Oficina del Peregrino llegaron más de 1500 peregrinos . Solo en un día. Una auténtica Romería. El Camino lo hice en Agosto y fue una de las mejores experiencias de mi vida. Independientemente de que esté o no de moda , hay mil razones para hacerlo. Lo aconsejo. Yo repetiré.